Drowning is the number one cause of death for children under five in Florida, Arizona, and California, with a ranking of number two for over a dozen other states. For every drowning there are eleven near drowning incidents, according to government statistics; many of which result in totally disabling brain damage. Supervision is always your primary layer of pool safety protection, but as the study shows, 69 percent of the drowning incidents occurred when parental supervision failed and there were no other backup layers in use. 1.Access doors to the pool area with high locks. 3.A pool fence separating the pool from your home and all access doors and entrances. 4.Alarms both in the pool (pool alarm) and worn on the child (personal immersion alarm). 5.Water survival training for a child as soon as he is capable of crawling or walking to the pool. 6.CPR and your knowledge of rescue techniques are a final layer of protection should there be an accident. The goal, with instituted layers of protection, is to come as close to a fail-safe system of preventing drowning incidents as possible. This way, if there is a momentary lapse of supervision for whatever reason, we have several backup systems in place. Even if your home is equipped with an alarm system that will beep when perimeter doors are opened, install simple contact alarms on the more often used doors as a further safeguard. Pool Guard and Safety Turtle, for example, make excellent alarms designed strictly for access doors and gates to the pool area. Door and gate alarms must have the button (adult bypass switch) pushed whenever the door is opened. Door alarms require either a second bypass switch and or a 7 second delay to inhibit adult alarming in both directions. 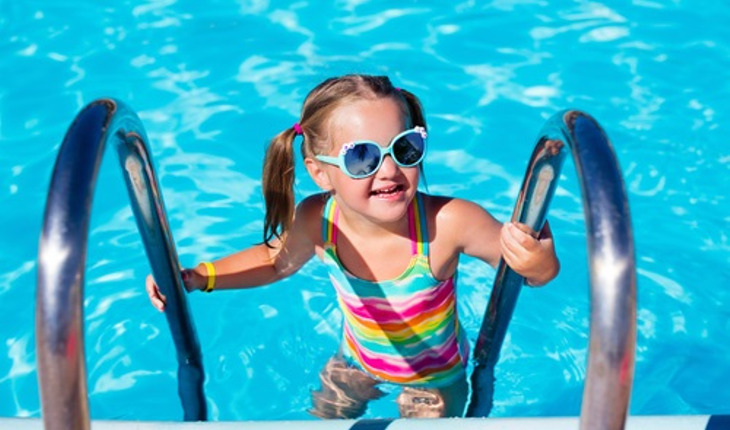 A door alarm is particularly useful if you have older children who open doors to the pool area. Sliding glass doors should be locked at the top in addition to other locks. In two thirds of the drowning cases studied where children were thought to be in the home, sliding glass doors were either left open or opened by the toddler. No doggy doors. They are attractive to children and have been implicated in dozens of toddler drownings. Floating (surface) pool alarm devices with remote alarms sounding in the home can alert you to a child falling into the pool. The pool surface, however, must be disturbed enough by the fall to set off the alarm. Since these alarms do work off a disturbance to the surface of the pool; your child could quietly walk down the steps, go under, drown, and never disturb the alarm or set it off! They are quite inexpensive and better than nothing at all since they do detect some accidental falls if adjusted and placed properly. Personal immersion alarms have sensors worn on the child, usually on the wrist. When the sensor gets wet, it sends a wireless signal to a remote base station, usually located in the house, which alarms loudly. Of all alarms, this design is the most versatile. Safety Turtle by Terrapin is the top choice for personal immersion alarms. The Safety Turtle consists of two main components: a key-lockable wristband worn on the child that resembles a wrist watch with a turtle on it, and a base station unit that remains within earshot of adult supervision. Safety Turtle offers continuous protection to the wearer and is never turned off for pool use or maintenance. It also protects against ALL water hazards, including buckets and ponds, and possibly adjacent neighbors’ pools. The drawback to Safety Turtle is that it only protects the child(ren) wearing it. If a neighbor’s child gains access to the pool, the Safety Turtle will not help. Parents have to be vigilant about having the Turtle wristband on the child’s wrist at all times, yet take it off for a bath. Putting the Turtle on is simple, and if you can put pants on him every day, then you can put the Turtle on, too. We recommend you make this part of the daily routine. Turtle devices are for pets, too; although most pets swim, few can get out of a pool unassisted, and many quickly drown as a result. Have your toddler trained in a course of pool survival when he is able to crawl or walk to your pool. One method of water-survival training is to teach the child to roll over and float on his back. It also is effective and has been taught successfully for many years. Be certain that he is also taught how to get to the side of the pool and hang on or get out in addition to learning to roll over and float. Survival swim instructions must be reintroduced to the toddler after a period of not being in the pool; as in over the winter months. Keep them safe and play by the rules.